Growing up, Thanksgiving was not Thanksgiving without stuffing. While I can’t recall the last time Mom stuffed a bird, I know that whenever we have turkey, we have stuffing. Even if it is July. While cooking stuffing inside a turkey is traditional, I find it much easier, and even better, to grill it separately. Every year, we alternate the major holidays between our homes. Knowing full well I will be grilling a turkey before the year is out, I’ve decided to put my spin on stuffing. Not surprisingly, I’m adding beer. It is fitting the month of November is home to International Stout Day. The stout is one of my favorite beer styles. It’s full of roasted malt, often balanced by notes of chocolate and dark fruit. 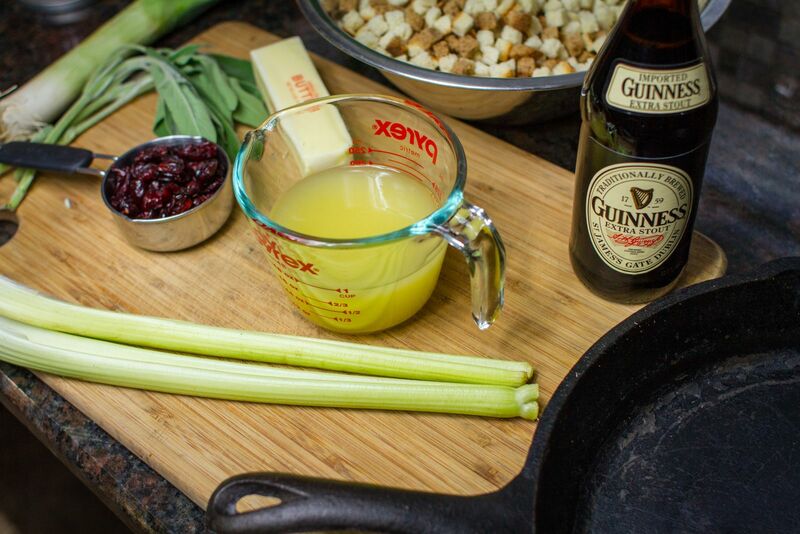 Not only is it great to drink, it is great to grill with, as this stuffing recipe will prove. 1. Preheat the grill for indirect cooking over medium heat (350F). 2. In a large cast iron skillet, melt the butter over medium high heat on either a stove top or side burner. Add the leek and celery. Cook until lightly brown, stirring occasionally, for approximately 8-10 minutes. 3. Add the bottle of beer, followed by the sage, parsley, chicken broth, and eggs. If you want to do some quality control testing before pouring the beer, you certainly have my permission to do so. 4. Turn off the heat and stir the contents of the skillet. Add in the bread cubes, cranberries, salt and pepper. Stir the bread into the liquid and combine evenly. 5. Using indirect medium heat (350 F), grill the stuffing for approximately 30 minutes. Remove and serve.